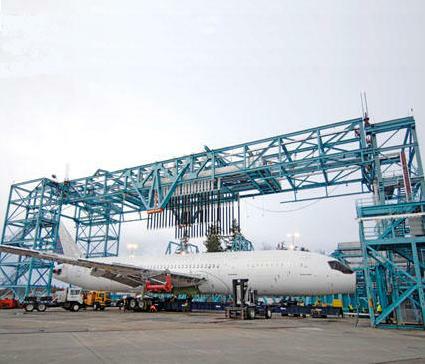 On Sunday Boeing moved the 787 Dreamliner fatigue test airframe to its structural test rig. The test rig is located in the northwest corner of the Everett, Washington site. Test set up is expected to begin immediately, with tests commencing midyear. The Boeing team continues to meet their milestones. Recently Boeing 787 Dreamliner pilots conducted the program's first stall tests in which pilots intentionally reduce power to both engines and then recover normal flight speeds - as part of the initial airworthiness program for the airplane. Additional stall tests will take place throughout the flight test period. The testing went "very well and there were no surprises," said 787 Chief Pilot Mike Carriker. The purpose of the testing was to demonstrate that in the rare event a pilot encounters a stall during flight, the airplane reacts benignly and allows for a smooth recovery. A stall is defined as flying so slowly that the airplane is no longer generating lift. During stall maneuvers pilots use a disciplined process to slow the airplane down at precise increments to the point where it shakes dramatically, resulting in forces of 1.5 times the force of gravity. In mid January Boeing completed initial airworthiness testing on the 787 Dreamliner. This milestone will enable more crew members to take part in flights and will allow more airplanes to join the flight test program. "This is an important step forward," said Scott Fancher, vice president and general manager of the 787 program, Boeing Commercial Airplanes. "We are very pleased with the results we have achieved so far. The airplane has been performing as we expected." Since the first flight in mid-December, the program has conducted 15 flights, achieving several key accomplishments. Pilots have taken the airplane to an altitude of 30,000 feet (9,144 m) and a speed of Mach 0.65. Nearly 60 hours of flying have been completed. Initial stall tests and other dynamic maneuvers have been run, as well as an extensive check-out of the airplane's systems. Six different pilots have been behind the controls of the 787. In the weeks ahead, the team will continue to expand the flight envelope at which the 787 will operate to reach an altitude of more than 40,000 feet (12,192 m) and a speed of Mach 0.85. Subsequent testing will push the airplane beyond expected operational conditions. "The pilots have told me the results we are seeing in flight match their expectations and the simulations we've run. That's a real tribute to Boeing's expertise and the international team that helped develop and build the airplane," said Fancher.